It’s always the same. The weather has justr started looking up here and the shops have got their winter clothes in. I even said to myself the other year, “I would hate to go on holiday at this time of year!” As I’m going over to Mallorca again in August, I’m still looking for summer clothes. And, unfortunately, the sales are terrible. If there ever was anything good, it has been already been snapped up by the time I hit the racks! Even so, after trawling round for hours, I did manage to find a couple of summery bits. Prints come in every summer and I especially love anything Aztec inspired. I’m not usually a fan of Bershka, I find it almost too ‘European’, ie. full of clothes that are a couple of seasons behind and cheap, not just in the price way. 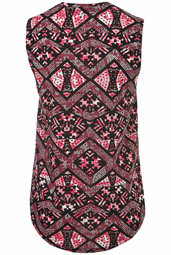 But I did find this printed, body con skirt there and I even managed to find a baggy black top for £7.99 to go with it. I also found an Aztec print vest in my favourite ever shop, Topshop. And this morning I’ve had my highlights done, so I am super holiday-ready…even though I don’t go for another four weeks! I now have a couple of other things on my wishlist before I go. I really want a dip hem dress or skirt but every one I’ve tried on is too long for me, I clearly need to visit the petite section! I also want a peplum top. I can’t get too carried away though…I’m only taking hand luggage! Previous story What To Buy Next?